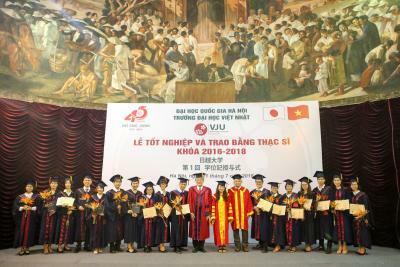 On July 21st Saturday, 2018, Prof. Yoshiki Matsui and Prof. Tohru Inoue from the Faculty of International Social Sciences of YNU attended the 1st graduation ceremony for the Vietnam-Japan University (VJU) held in Hanoi, Vietnam. From October 2017 to February 2018, 17 VJU master students who specialize in the field of enterprise management studied in YNU as special audit students, and 6 YNU professors from the Department of Business Administration led their researches and examined their master’s thesis. Some of the 1st VJU graduates will be employed by Japanese companies, and some of them wish to pursue doctoral degree in YNU. After the completion of two years program in VJU, they are expected to become the bridge between Vietnam and Japan in the future.